In life, it isn’t always about the path you take; it is about the people you meet along the way who leave you with a lasting impression…. Beautiful, smart, talented, determined and full of fun is how I would describe the three Thomas sisters, Abby, Caroline and Georgia, who have crossed my path. The Thomas sisters live in Elk City, Okla., with their parents Josh and Christi. Although the three girls are similar in many ways, they are as different as night and day in other ways. Abby, 17, is the oldest of the sisters. Abby plays the banjo, sings, hunts and loves to work with young horses. Abby competes in goat tying and breakaway roping and is a fierce competitor in and out of the arena. Her favorite event is breakaway roping. While Abby is driven and wants to win, she is also one of the biggest fans for not only her sisters, but her friends, whom she competes alongside in the arena. Caroline, 15, is the middle sister. Caroline hunts, plays the mandolin, the fiddle and sings. Caroline often sings the national anthem at rodeos and has recently begun competing in singing competitions. When I hear Caroline sing, I am amazed and in awe of the big, strong, clear voice that comes from such a petite young lady. Caroline is also a force to be reckoned with in the arena. She competes in barrel racing, pole bending, goat tying and breakaway roping. Her favorite event is breakaway roping. Last, but not least is the youngest of the three sisters, 12-year-old Georgia. Georgia hunts, plays the guitar and unlike her older sisters who are shorter in stature, Georgia is tall and thin like a run-way model. Georgia loves to bake and can often be found in the kitchen trying a new recipe or making up her own recipe. Georgia, like her older sisters, holds her own in the rodeo arena. Georgia competes in pole bending, goat tying and breakaway roping. Her favorite event is goat tying. When Abby was about three years old, Christi purchased an older horse for Abby to ride. As she and Josh added girls to their family, Christi kept adding horses. When I asked Christi what made her want to start buying the girls horses, she said she simply wanted to share her love of horses with the girls and really had no intentions of the girls rodeoing when she first began purchasing the older horses. In 2011, Josh purchased a paint horse from a well-known rodeo family for a Christmas gift for Christi. A few months later, Steve Haley, a retired roper, came to their home to get shoes from a farrier who was at their place trimming horses. Steve quickly took to the three sisters, and before Josh and Christi could blink an eye, Steve and the girls were roping the dummy. A few weeks later Christi was hauling Abby and the new paint horse to Sam’s several times a week to rope calves. 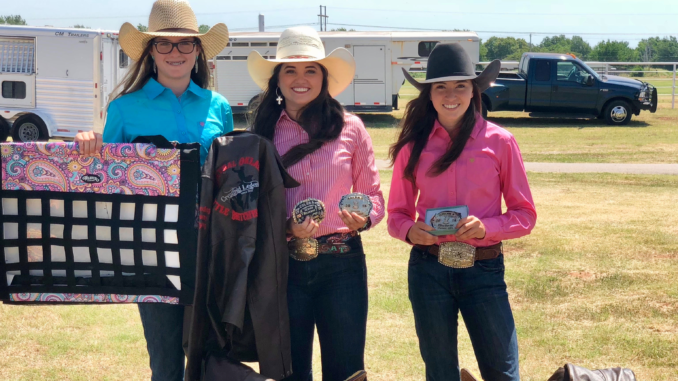 One thing led to another and another and the girls were entered in the Northwest Oklahoma Junior Rodeo Association. That same summer is when I first became acquainted with the Thomas family. I was a volunteer at the Camp of Champions, a Christian rodeo camp held each year in Sayre, Okla. I was helping in the breakaway and Abby was one of the girls attending the camp in that event. Abby was having some trouble with her horse, so I took her and her horse aside. I checked the paint horse’s bridle, saddle and other gear to make sure nothing was bothering him. While doing this I started visiting with Abby about her horse. During our visit I learned whom they had purchased the horse from. I knew the rodeo family who had previously owned the paint horse. Having known the family, I knew at once that the paint was a good, solid level-headed horse. The reason Abby was having a few problems was simple. Abby’s riding style and the previous owner’s riding style were completely different. With a few minor adjustments and help from the other instructors, Abby and the paint were soon working together like a charm. Learn more about the Thomas Trio in the January issue of Oklahoma Farm & Ranch magazine.